Have you applied for a Credit Card at ICICI Bank? Did you receive the Credit Card by post? Do you have the User ID and Password to access the Credit Card details online? You don't need to visit the bank once again. 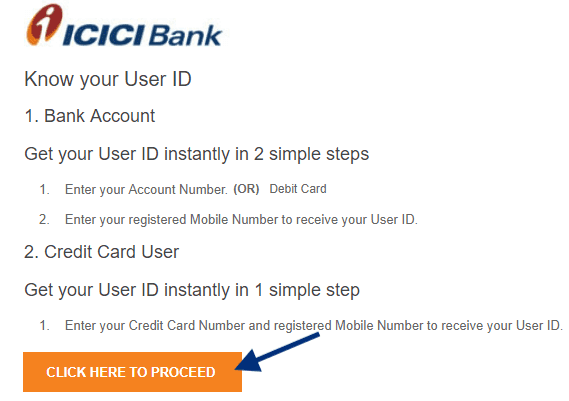 You can get Online ICICI Credit Card User ID and Password by self. You need to follow few simple steps. Step 1: Dial the customer care number dedicated to Credit Card services. You require authenticating self by providing few details. Select the Self Banking option following the IVR response. You will receive the User ID. Or Visit https://infinity.icicibank.com and click on the 'click here to proceed' button. Step 2: Choose credit card option and enter the 16 digits credit card number in the first empty field. Enter your registered mobile number in the second field and click the Go button. User ID will be sent to your registered mobile number immediately. You have to activate the user ID by generating a password online. Step 1: Now you need to create the password by visiting https://infinity.icicibank.com/corp/Authentication. You will get guided to the page directly where you need to click on 'Click Here to Proceed'. Step 2: Next enter your user id and click the Go button. Step 3: A new web page will open where you have to enter your User ID and registered Mobile number. 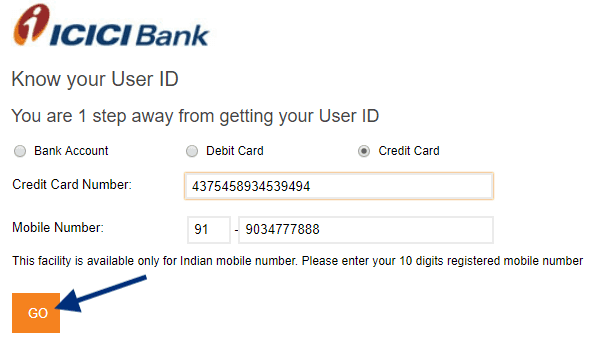 Step 4: Now, you need to enter the Unique number that you received on your registered mobile number, in the provided box. Click the go button to proceed further. Step 5: Now you are eligible to generate the password for accessing online account for Credit Card. You can also create a new User ID changing the default User ID received from the bank. Accessing the Online facilities for Credit Card, you can view your current balance, view the previous statements, verify the unbilled statement, make online payments and access many more facilities. You will get control over your credit card.